Available from online vendors so I will not be posting a sample. Presented here to share the cover and note excerpts. Once again Lyman and his small combo get the job done on this set, producing creative jazz/island inspired arrangements. Good stuff! From the back cover: Dreams of a Lyman happening are fully realized when one enters the Canoe House at the beautiful Ilikai Hotel, on the beach at Waikiki the sensuous beat of the Uli Uli – the low tones of the Ipu, and the trumpet like call of the Conch Shell. There, a bronzed figure by his vibraharp, Arthur Lyman pours forth the seductive melodies of the Island and holds sway his audience-hypnotized by the magic of the mood. Arthur and the fellows, Harold Chang - Percussion, Clem Law - Piano, Archie Grant - Bass, weave their arrangements applying their vivid imagination and the use of the myriad of instruments at their disposal. One of the newest is the Hohner Clavinet C, and electronic keyboard that provides a new unique sound the mechanical vibrations of the strings are transformed into electronic vibrations and fed into its own amplifier. Clem has mastered the instrument and uses it effectively in the selection "Windmills Of You Mind." Some of the fun things of a Lyman Happening are watching the fellows criss-cross their paths changing instruments, singing along during their shows and listening to their patter, in pigeon English or just listening to the people sitting around "oohing and ahing", tapping their feet to the rhythm, or listening to the girls comments like "what a man, what a beautiful man." 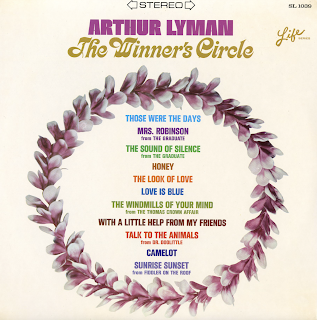 The Windmill Of Your Mind - From "The Thomas Crown Affair"
Talk To The Animals - From "Dr. Doolittle"
Mrs. Robinson - From "The Graduate"
Sunrise Sunset - From "Fiddler On The Roof"
The Sound Of Silence - From "The Graduate"